A coastal state in America’s Pacific Northwest, Oregon is famed for its pristine wildlife and gorgeous landscapes. Its rich natural beauty and diversity has led to dozens, if not hundreds, of trails and hikes being mapped out over the years, all of which are enjoyed the by thriving nature-loving community of the state. Because of how gorgeous the forests, mountains, farms, and beaches of Oregon are, travelers have come from near and far to get a taste of what the state has to offer. But with so many breathtaking places to see, where do you start? Here are some of the best hikes that Oregon has to offer. Majestic and breathtaking, Mount Hood is one of the most popular mountains to visit in Oregon, with most hikers stopping by during the winter months. In contrast, the east side of the mountain provides a welcome reprieve from the crowds and a remarkable tranquility. The best place to start is the Elk Meadows Trailhead, which will take you through a path surrounded by mixed firs, black huckleberries, and hemlocks, then past the Clark and Newton Creeks. After exploring Elk Meadows, continue on to the Sahalie Falls Trailhead for a beautiful introduction to Oregon’s incredible rivers and waterfalls on an old-growth forest loop. The pinnacle of this trailhead is the 100-foot-tall Sahalie Falls, one of the McKenzie River’s two grandest waterfalls. Visitors can expect a moderate hike through both trailheads with an elevation gain of 780 feet for Elk Meadows and 400 feet for Sahalie Falls. Sitting on the southeast side of Mount Hood, the Umbrella and Sahalie Falls Trailheads offer you an eye-catching display of flowers and more while you explore this gentle flank of the volcano. Your hike will start on the Umbrella trail, which features an open forest junction that quickly shifts to a climb on a rocky bluff. As the trail levels off, lovers of the outdoors will find themselves at a small meadow until you reach the graceful and Umbrella Falls. Once you have sufficiently enjoyed the peace by the falls, cross a footbridge to make your way towards the powerful Sahalie Falls. There’s a lovely place by the East Fork of the trail that is the perfect place to stop for lunch. Don’t forget to stop by the bridge viewpoint to take in the fantastic vistas that this side of Mount Hood has to offer. There’s nothing quite like standing at the peak of Neakahnie Mountain and staring out into the distance to see the glorious ocean waters meet the clouds. To get to this magnificent spot, the only way is through the 6.4-mile loop of the Neahkanie Mountain Trail, a fantastic back trail that is home to gorgeous wild flowers and several activity options. Open from March until November, this mountain trail is officially rated as moderate and has a 2,401-foot elevation gain. Visitors are welcome to bring their dogs with them on the trail to enjoy the nature trail, while outdoor activities like road biking and trail running are also encouraged. The best views are undoubtedly found at the coastal peak where hikers can soak up the magnificent views of the Pacific. Named the best trail in the United States by Bike Magazine in the past, the McKenzie River National Recreation Trail is undoubtedly one of the most beautiful in the state of Oregon and perhaps one of the most beautiful in the country as well. It’s a popular place to visit for mountain biking in particular, though other visitors also come to hike or to enjoy some trail running. Most of the trail goes through old growth forest, with gorgeous waterfalls, pools, log bridges, and the crystal clear blue waters of the river to see along the way. While on this trail, hikers and bikers alike will come across old lava flows coming from Mount Washington, while the Clear Lake and the Great Spring are also marvelous sights to behold along the way. If you are inclined to do so, you can even take the trail down to the Sahalie and Koosah falls, passing incredible viewpoints along the way. A family friendly trail that’s open all year, the Klickitat Trail takes visitors around the Swale Canyon and along the gentle Swale Creek for a unique experience with nature. The trail starts by following the first 31 miles of an old unused railroad corridor that used to serve as a link between the towns of Goldendale and Lyle. 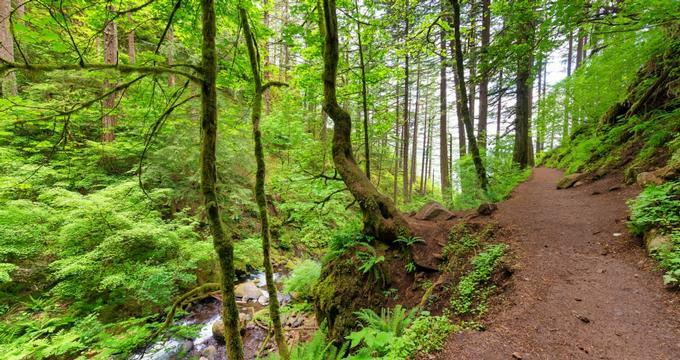 The path then diverges into a unique trail that winds along the nationally designated Wild and Scenic River area of the Columbia River Gorge. From here, hikers can take their families of an exploration of the canyon rim rock or pass along the balsamroot and flower covered slopes of the area. You’ll come across eye catching geologic formations and spectacular sceneries dotted with colorful wildflowers, beautiful hills, and awe-inspiring wildlife like the bald eagle. Go on a quick getaway into the serenity that only nature can provide at the Historic Columbia River Highway State Trail. On this fantastic trail, visitors can explore the wildlife on the bike path or walk in silence through the hiking trails. Picnicking and stops to the viewpoint for a gaze at over 12 miles of great vistas are also great ideas while on this trail. Travel the old mossy paths of the Salmon River Trail to enjoy the unique, wild and scenic surroundings of the Salmon River. Enjoy a leisurely trek through the gentle terrain and enjoy some wild fishing at the river while you’re at it. Known as the first “rails-to-trails” state park in the state of Oregon, the Banks-Vernonia State Trail allows visitors to explore the abandoned railroad bed that threads through the 21-mile stretch connecting the cities of Banks and Vernonia. It features an 8-foot wide hiking and bicycle trail as well as a four-foot wide horse trails. Traverse the Opal Creek Trailhead to enjoy the best of the creek’s wilderness and to spend some quality time alone or with friends and family at the recreation area. Apart from fantastic hiking, the area has great lake and pond fishing opportunities as well as horseback riding, camping, and nature viewing. A designated National Recreation Trail, the Fall Creek Trail is a hiker-only route that allows all visitors to bask in the cool air of the valley while reveling in gorgeous streamside vegetation. Camping is available in the Bedrock Campground and is easily accessible through a route of level ground, log bridges and gentle streams. Starting at the Timponogas Campground and ending by the Sand Prairie Campground of the Willamette National Forest, the Middle Fork National Recreation Trail is a stunning multi-use trail. Moderately strenuous, the trail features a segment of the historic Oregon Central Military Wagon Road for a unique blend of nature and history. Soak up the majestic atmosphere of the Redwood trees of the Chetco Ranger District at the Oregon Redwoods Trail. Truly marvelous, this trail provides a moderate day hike opportunity to visitors and loops through the northern range of the Rogue River-Siskiyou National Forest. The Sweet Creek Trail navigates the gentle and serene waters of Sweet Creek. On the trail, hikers will come across 11 elegant waterfalls framed by a natural formation of ferns and mossy rocks. At the same time, they will travel under the cooling canopy of towering big leaf maples, alders, and Douglas-fir trees. Located in the Siuslaw National Forests, the Drift Creek Falls Trailhead is a great place to bring the family for a quick day hike. With an easy to intermediate difficulty level, kids and adults alike will undoubtedly get a lot out of breathing in the fresh air and simply reveling in the beauty of the nature around them. From easy hikes along guided trails to equestrian and bike trails, Forest Park magnificently merges the outdoors with history. The trail, and subsequently the park as a whole, is home to a glorious eco system of flora and fauna. Enjoy the 30-mile trail while walking through substantial undergrowth and under a massive tree canopy. 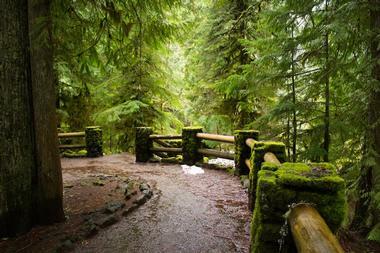 Open to hikers only, the Old Growth Trails travel through a breathtaking Douglas-fir forest. Hikers can set off on the hour-long hike while allowing the quiet beauty to envelope them at every step. 5.3 miles long with an elevation gain of 1,505 feet, the Abiqua Falls Trailhead is a difficult hike that culminates at what could possibly be the most beautiful waterfalls in Oregon: the Abiqua Falls. With a steep and slick route, this trail is perfect for the more seasoned hikers out there looking for a new challenge. Located in the Willamette National Forest, the Stahlman Point trail traverses a younger Douglas-fir forest and allows visitors occasional glimpses at the picturesque Detroit Reservoir. Make sure to stop and observe the wonder of nature through the many Osprey nests in the area and the Ospreys soaring through the sky. Cherished for its magnificent hiking trails, gorgeous wildflowers, and one-of-a-kind scenery, the Saddle Mountain State Natural Area features a 2.5-mile hike to the summit and a short 0.16-mile side trail to explore the wilderness. Make use of the picnic area and the seasonal campground for a complete experience. Featuring one of the most prominent and distinct geological landmarks in the Columbia River Gorge, the Beacon Rock Hike is a 1.8-mile loop that is moderate in difficulty and full of trailside beauty. The 848-foot Beacon Rock is one of the tallest monoliths in the country and is the main draw of the hike. Starting at the Eagle Creek Trailhead and ending at Buck Point, the Buck Point Hike is 1.8-mile trail loop open year-round, and it is the perfect place to enjoy the vistas of the Western Gorge. Consider staying overnight at one of the campsites for a night under the stars. There’s something ethereal about the Fairy Falls Hike. One of the most popular hikes in the area, the trail head passes several waterfalls before culminating at a resting area by Fairy Falls. Every step is rewarding and allows you to fully appreciate nature. A 1.6-mile hoke with a 575-foot elevation gain, the Steamboat Mountain Hike is relatively easy and is the perfect introduction to hiking for beginners. The trail climbs the Steamboat Mountain’s east wall and offers the best views of Steamboat Mountain and the nearby quarry. Walk amongst giants within the 51 acres of land protected by the North Fork Siletz River at the Valley of the Giants Loop Hike. The humongous Douglas-firs in the area are truly a magnificent site and bring an inexplicable feeling of wonder, as many of the trees are close to 500 years old. Hike to a prominent summit in the Old Cascade on the Rocky Top Hike. The trail will take you through a lovely meadow powdered with a gorgeous array of flowers during the summer season. Thickets of huckleberry and white rhododendron also litter the trail, which also offers fantastic views of several volcanoes like Mount Hood, Battle Ax, Three Sisters, and Mount Jefferson.